Sounds a little bit lurid to me, like it is some kind of reference to female anatomy. I’ve never heard it used like that but maybe I can start a trend. All these sound legitimate, I’m sure they’ll enter the popular parlance in a heartbeat. It doesn’t even matter what part of the anatomy it is applied to, breasts, calves, who cares. I can just picture the guys leering now. Anyway, I like big bells. I was talking to this Harvard alum at a mixer a long while back when I first got to China. She was asking what I was looking forward to seeing and I told her I wanted to see the big bell temple or 大钟寺. She replied she had never even considered going there. I told her all about the difficulty in casting something that big, which requires an elaborate one of kind mold, a careful mixture of bronze which isn’t an element but a compound, not to mention the difficulty of producing all the heat. I had seen a TV special on casting bells while in Japan. Very few people know how to do it still, so when a temple needs a new bell they pretty much have to call in this one old dude. Then there are all the religious rites to consider. I also told her my favourite bell story about Chionin and how the female devotees all donated their hair to make a giant rope so it could be hauled up the mountain side. 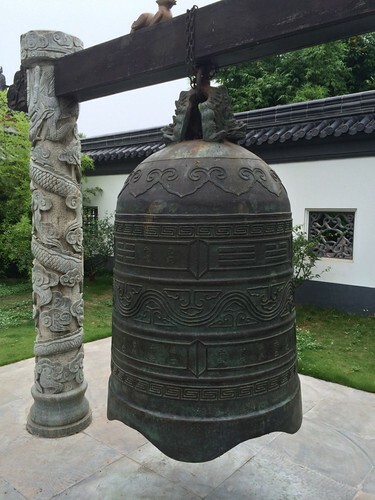 The biggest bell at the big bell temple is bigger than the bell in Chionin. There is another huge bell in the bell tower. I mean how do you get something that weighs that much to the top of a tower with only muscle and sweat? If your bronze mixture isn’t perfect, the bell will crack when first struck. Supposedly the three largest bells ever made were made by Russians, their largest bell by weight broke during casting. All thate time to make the custom mold with all the Buddhist/Christian scriptures lost. 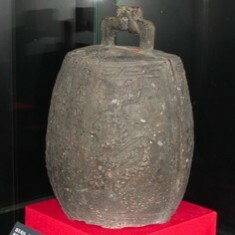 The biggest bell at the big bell temple, is thus only the fifth largest in the world by weight, but it is considered the King of Bells by the Chinese due to the elaborateness of the casting. The one at the top of Beijing’s Bell Tower is slightly larger. In addition to the King of Bells, the temple has a whole museum of bells made of Bronze and Iron. Many of them are frickin’ big. There was a lot of reconstruction going on while I was there, so I might have missed some things, but I got some decent pictures. One tradition they have is throwing coins into the top of the bell. If you get it in you’ll have good luck or become rich or something. You also have to pay 2 RMB to go up. I chucked the four coins I had, two 5 Mao and two 1 RMB. Then I started making paper airplanes out of my smallest bills. When I was down to my second to last 1 RMB bill a Chinese couple climbed up the stairs. They had an entire roll of the smallest Chinese coins. I should have thought of this, I saw a similar thing in Thailand. They gave me a few coins and I got the third one in the hole and gave the rest back. I was going to buy a small bell as a souvenir but they seemed too pricey and they didn’t haggle or I didn’t haggle. Finding the temple was epic for the cab driver. We had to stop and ask no less than six other cab drivers where to go. I even wrote out the characters to make sure he understood me. When I finally got there, I realized I had already walked by it once on my way to Walmart. Knowing how much some guys like big bells, here is a pictures I took almost ten years later in Nanjing. I eventually put a lot of pictures on Flickr even though it is blocked in China, I struggle with the VPN and iPhoto / Photos to upload my best pictures, here are my best pictures from China. 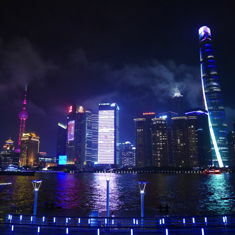 I also collected my best blog posts about China into a list, for those who like lists or reading about China. This entry was originaly posted on February 11th, 2006 , it was last edited on February 9th, 2019 and is filed under: Asia and tagged: Beijing, China, Japan, Photos.